After arriving at the Delhi airport, meet our representative who’ll guide you to one of our listed hotels. Check-in at the hotel. Rest and relax in your hotel room. In the evening you have the option of exploring the hyperactive night life of Delhi. Enjoy dinner and overnight stay at the hotel. Next morning post breakfast, move out on a city tour of Delhi. The major tourist attractions of Delhi include the Birla Mandir, Qutab Minar, Red Fort, India Gate, the Jama Masjid, Humanyun Tomb, and President’s House. In the evening, get transferred to the railway station to board an overnight train to Mussoorie. Next morning after reaching Mussoorie, get transferred to one of our listed hotels. Check-in at the hotel. After resting for the afternoon in your hotel room, walk around the Camel’s Back road for its calm and refreshing surroundings. While walking on the Camel’s Back road also enjoy the stunning Himalayan panorama. In the evening return to the hotel for dinner and overnight stay. In the morning after breakfast, move out to explore the vast stretch of Happy Valley road. This place indeed promises a happy feeling with so many places of interest to explore – estates, temples or sprawling gardens. In the afternoon pay a visit to Gun Hill, Lake Mist, Kempty Falls and the Mussoorie Christ Church. Later in the day pay a visit to the Tibetan Refugee Camp. Enjoy dinner and overnight stay at the hotel. Next morning after breakfast, leave for Rishikesh by surface. Located on the pious banks of holy river Ganga, Rishikesh is visited by a large number of pilgrimages from around the world. As you reach Rishikesh, get accommodated at one of our listed hotels. Afternoon to be spent in the hotel room. In the evening attend the Aarti ceremony at Triveni Ghat. After attending the Aarti return to the hotel for dinner and overnight stay. Start your early to enjoy boat rides on river Ganges in the tranquil and soothing environment. After breakfast, set off to explore the holy town for its major tourist attractions like the Lakshman Jhula,Bharat Mandir, Neelkanth Mahadev Temple, Tryambakeshvar temple and the Parmarth Ashram. Enjoy an overnight stay at the hotel. In the morning post breakfast, drive straight to Corbett National Park. Upon reaching the Corbett National Park, check-in at one of our listed hotels. The Corbett National Park is a paradise for wildlife enthusiasts and houses a population of 200 plus tigers along a massive topographical area interspersed with hilly ridges and rolling grasslands. The park offers you to visit a wide variety of species like Tigers, leopard and elephants. Enjoy jeep safari to visit this endangered species in their natural habitat from close quarters. Return to the hotel in the evening for dinner and overnight stay. Early in the morning visit the Corbett National Park for game viewing. Post breakfast, head straight to Ranikhet. 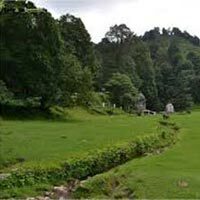 It is located in the Almora district of Uttaranchal. Its salubrious atmosphere, tall conifer trees and green meadows make it a unique hill station. On reaching Ranikhet, get accommodated at one of our listed hotels. Rest of the day is to be spent at leisure. Enjoy an overnight stay at the hotel. After breakfast, proceed to visit the Chaubatia Orchards. It is closely located to Ranikhet and is very famous for their extensive orchards of tasty apples, peaches, plums and apricots. Later in the day visit the other major tourist attractions like Jhula Devi temple, Mankameshwar temple and Bhalu dam. In the evening enjoy dinner at the hotel. Retire for the night at the hotel. In the morning leave Ranikhet to reach Binsar. Upon reaching Binsar, check-in at one of our listed hotels. After resting for a while in the hotel, move out to visit Binsar Zero Point from where one can get an unparalleled view of the magnificent Himalayan Range. Then visit the famous Bineshwar temple that is dedicated to Lord Shiva. 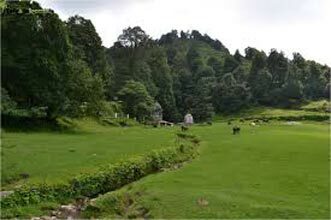 Later in the day explore the Binsar Wildlife Sanctuary, home to more than 200 species of birds, Himalayan bear, fox, leopard etc. Return to the hotel in the evening for an overnight stay at the hotel. Post breakfast, leave for Ramgarh- the place rich in orchards. This heavenly hamlet is also known as the “Fruit Bowl of Kumaon”. As you reach Ramgarh, check-in at one of our listed hotels. After resting for the afternoon at the hotel, step out to explore Ramgarh for its pristine environment and a gigantic view of Himalayas. In the morning after an early breakfast, proceed to Nainital by surface. On arrival at Nainital, check-in at one of our enlisted hotels. Rest and relax for a while in your hotel room. Later in the day embark on a sightseeing tour of Nainital. The major tourist attractions include the Khurpatal Lake, Waterfalls, Hanuman Mandir and Observatory. Also enjoy the cable car ride to Tiffin Top and boat ride in Naini Lake. In the evening enjoy shopping at Mall road. Overnight stay at the hotel. In the morning head on an eight hour long drive to Delhi. On a reaching Delhi, check-in at one of our listed hotels. Rest and relax in your hotel room for the whole day. Stay the night at the hotel. Early in the morning get transferred to railway station to board a train to Agra. Upon reaching Agra visit the major tourist attractions like the Taj Mahal, Agra Fort, Itimad-ud-Daulah Tomb, Sikandara and Fatehpur Sikri. In the evening board a train back to Delhi. On arrival in Delhi, get transported to Delhi airport to board a flight for your onward destination.